Standing on the shore of the river that cuts through his hometown of Cotui, Dominican Republic, fishing lure in the water, Ramon Ortiz just wanted to catch dinner for his family. At twenty-two, he had long outgrown his baseball dreams and had turned to fishing simply to put food on the table. Sitting next to him, his cousin Pedro Liriano, a former big leaguer himself, nods his head and smiles at the story he has heard countless times over the years. It didn’t take long for Ortiz to convince the scout that he could pitch. If a movie were to be made about Ortiz’s career, it would culminate in Pacific Bell Park during Game 3 of the 2002 World Series. Playing on the road against the heavily favored Giants, the series tied, Ortiz took the mound and delivered a win for the Angels, pitching five gutsy innings against one of the highest-powered offenses in baseball. The end credits would roll as Ortiz and his teammates swarmed the field following the final out of Game 7 as World Champions. But it would be far from the end of Ramon Ortiz’s baseball story, and the impact he has made on the game has been far greater than any World Series title. Adjustment to the United States can often be an incredible struggle for Latin American baseball players, often signed away from their families and homes as teenagers and forced into a new country, culture, and language with little support off the field. Following his baseball career, one that lasted twelve major league seasons, Ortiz returned to the Dominican Republic determined to continue to help young baseball players like he had Liriano. With Liriano’s help, Ortiz has established a baseball academy in the Dominican Republic that provides young ballplayers, many from impoverished backgrounds, the opportunity to pursue their baseball dreams. Together they founded the Ramon Ortiz and Pedro Liriano Foundation to raise the necessary funds to provide little league ballplayers in their country with adequate equipment, playing fields, and uniforms. Ortiz and Liriano have chosen baseball as the vehicle through which to achieve their lofty goals for their home country for many reasons. Even with Ortiz and Liriano backing it, their academy has many needs. Quality equipment is hard to find in the Dominican, as are adequate playing fields. Isaias Franco, a teacher from Northern California, was moved by the Ortiz and Liriano Foundation’s mission and took it into his own hands to outfit Dominican little leaguers with equipment and uniforms. After collecting donated equipment for months, Franco traveled to the Dominican to distribute it in July. But after meeting Ortiz and Liriano and the young players at the academy, Franco is optimistic for the future of Dominican baseball. “I thought their academy was such a beautiful concept. It’s not only baseball-centered. It’s community-centered. Parents and families come out and are a part of the entire process, cheering on the kids and keeping the field in shape. After donating hundreds of gloves, jerseys, bats, balls, and hats on his first visit, Franco has already begun planning a return trip to bring more equipment to Dominican little leaguers. In partnership with many stars from the island, including future Hall of Famer Vladimir Guerrero, he has also organized a baseball tour and fantasy camp during which fans will tour the country and play against many of the big league stars from the island to raise money to support future projects in the DR.
“As a life long baseball fan, giving back to those less fortunate is the least I can do after having received so much from baseball and life in general,” Franco says when asked about his inspiration for his charitable work in the Dominican. Franco has many goals for Ortiz and Liriano’s academy and surrounding communities. 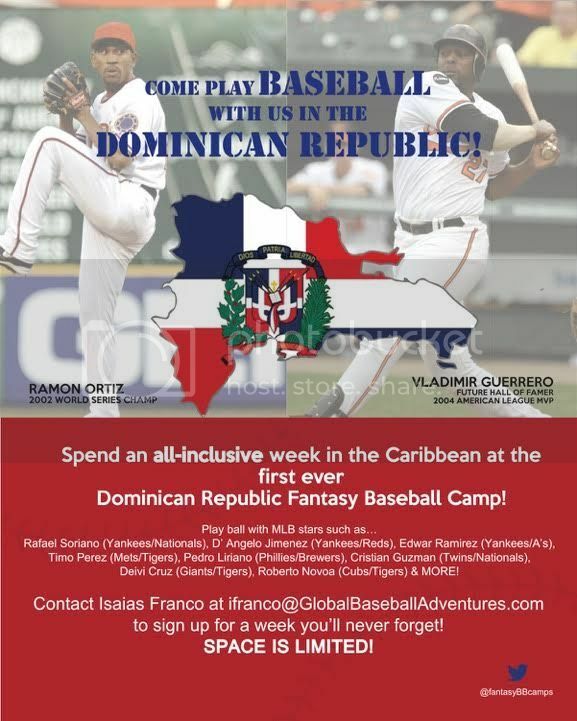 If you are interested in finding out how you can support Ramon and Pedro’s foundation and academy in the Dominican Republic, please contact Isaias Franco at IFranco@GlobalBaseballAdventures.com. Donations of baseball equipment are greatly appreciated as are monetary contributions through Pro Athletes With Jesus. Monetary contributions will be utilized to help build a baseball field for little leaguers in Fantino, DR. In partnership with Ramon and Pedro and other Dominican baseball stars like future HOFer Vladimir Guerrero, Isaias will be hosting a fantasy baseball camp in the Dominican Republic this December with proceeds being donated to support baseball projects in the DR.
Daniel is an avid fan of international baseball and is the author of two books on the subject, Beyond Baseball and Beyond Baseball: Rounding First. Both books are available at www.danvenn.com. Proceeds from Rounding First will be used to support the non-profit Helping Kids Round First and their mission to bring Nicaraguan children opportunity through baseball.